this video for extra gum is…adorable. that donut is so cute. the banana and coffee? eeeee! jon: you know what movie was really good from last year? “pandora’s box”. did you guys see that? kara: hm…no, but it sounds familiar. what was it about? jon: it was amazing – it was like the best movie last year. it was spanish. really great; you should see it. pat: yeah, i don’t think i’ve heard of this one. cecile: who was in it? jon: ehhh, i can’t think of any of their names. but it was so. good. you have to see this movie. kara: oh man, i can’t believe i haven’t heard of this. “pandora’s box”…was it like, a retelling of the myth? jon: no, it was sort of like a fairy tale and it had these amazing special effects. i think it was directed by the guy who did “21 grams”. or cuarón. one of those guys that are all friends with each other. kara: …wait, guillermo del toro? …”pan’s labyrinth”? jon: …yeah. that one. …whatever, it was a good movie. update 2: going-away bbq confirmed for july 21 at josh’s place. more details as they come. going-away bbq details on evite. if i’ve forgotten your email address and you aren’t on there you can email me and i’ll add you or you can rsvp to josh directly. update: cecile sent me this ecard and i almost cried. yes. you read that correctly. my last post’s freak-out? due to finding out i couldn’t get my lease extended for another month. meaning i have to be out of my apartment in just over a month. meaning my plan to have time to have an apartment sale and stay longer at work and avoid buying multiple plane tickets and back and forth from california to the quad cities…that plan is scrapped. anyway, so yes. i’m moving to california. let’s go over the usual questions. i had been contemplating moving to LA back in february. i decided against it due to insufficient funds and the high cost of living in los angeles. then, a few weeks ago, out of nowhere, one of my best friends from high school told me she got a major promotion and she and her husband were moving from st. louis to LA. then she asked me to come and live with her. this is when most people get weirded out. i would be weirded out too. i’ve known of situations where a single person lives with a married couple and i’ve thought it was incredibly bizarre. but, when i thought about living with maria and clayton, i felt no weirdness at all. only a sense of things falling into place. even so, i told maria i’d have to think about it. i waited a week to be sure and then told maria i was in. no really, why are you going? i have been trying to leave chicago for awhile – trying to see life outside of illinois for the first time ever. first it was london, then san francisco, but neither move happened. work is slowing up – many projects are coming to an end but there is nothing really on the horizon. a lot of my friends have or are getting ready to move to the coasts. etc. living with maria and clayton would mean a nicer place for all of us and a built in support system (have you guys met maria?). i already own an emissions-compliant car. moving to LA means 24/7 nerdery with pat, and actually being around to fulfill my duties as meghan’s maid of honor. also, i don’t know if you’ve noticed but chicago, while gorgeous in summer, is like hoth in winter. during the week it took me to decide, in my heart i knew moving to LA was an opportunity i couldn’t pass up, and if i did i would hate myself later. but all i could think about were my friends, how close chicago is to home, where i work and how…well, comfortable i am here. but ultimately that’s why i have to go. i’m too comfortable. i’m complacent. i’m not growing as a person and i’m starting to take that disappointment out on the people around me. not cool. no, i mean WHY LA? i thought you hated that place. i liked it the last few times i’ve been there. the movie theaters! the getty! the winters without sub-zero temperatures! what do your parents think of this? what about your awesome job? my parents and grandma were enthusiastic, and while my friends were sad they were supportive. yesterday i told dawn and antonio, and while i was dreading doing so, they were both very supportive too. if you know someone that you think would be interested in taking over my job, let me know. this is not certain. i have to be out of my apartment by the end of june, but maria has not been given her official start date yet. no start date = no move date = no plane reservations. most likely i will spend a good deal of july at home with my family. i am leaving chicago on july 1 or 2 and will be staying with my parents for that month. i will be back in chicago for my going-away bbq on july 21 and probably for other things too. i move to california the first week of august. so did you get a job out there? no. flying blind. i’ll probably freelance for awhile, although i’m hoping to get involved in alternative comic books or maybe a bakery or something. did you meet a guy? you obviously don’t know me very well if you think i’d move across the country for some dude i just met. if not being able to sleep at night equals excitement, then…i guess? mostly i’m filled with anxiety about logistical concerns. hopefully things will be better once maria gets her start date and we can make real plans. maria got her start date; i’m still filled with anxiety about logistical concerns. actually, no. i feel this is the right thing to do and while actually making the decision was excruciating, now that the decision has been made i just want to get on with implementing it. now if we could just get that start date. is there some kind of going-away party? as per the original now scrapped plan, there was going to will be one on july 21. see top of page for details. i am not sure whether this will still happen or if anything will happen; it all depends on how the timing works out. yes, please! i’ll have plenty of extra space for guests and also a pool. other questions? leave them in the comments and i’ll answer them here for all to see. just when i think things are falling into place – working out – going so well…the rug gets pulled out from under me and i have to reevaluate. throw out the plan and start over. sigh. but i guess that’s the point, right? some ecards is FANTASTIC. these are the only cards anyone need send me, ever again. the flirting category is particularly great. i’ve been fiddling around with virb for the past day or so…and i think this is it: i think my nerd-prayers have been answered. if – IF – enough people get wise to this, virb could finally make myspace obsolete. well, it’s already obsolete, but maybe once people have tasted the good life of standards-complicance and css and ajax, they’ll realize myspace and its janky code really is incredibly crappy. i encourage everyone to join up; let’s do this people! let’s make virb the social networking site! i feel slightly ashamed/dirty about this advertisment-y post. but virb really is better. trust. singing to the deaf is a graphic design collection of visual songs. very cool. around slide #45 you can see a piece that has coppery word balloons you scratch off (lottery-style) to reveal the message underneath. update: dawn bought this and it is so so cool in person! eric sent me this and it’s awesome. the tribbles talk in 1pt-size-smaller voices like roast beef and spock talks totally normal. which is, you know, as it should be. 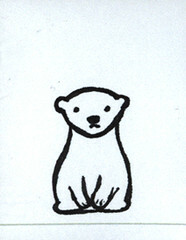 half inspired by my recent trip to the brookfield zoo, where i saw a super-cute polar bear cub. this cub is sad because the other half of the inspiration comes from this article about how the ice caps are actually melting 3x faster than scientists projected.